Despite moves in the educational curricula in Central Asia to teach English in primary schools and the gradual shift from the Cyrillic to the Latin alphabet, Russian remains the lingua franca of the region. Speaking Russian ensures you can chat with taxi drivers, yurt makers and bazaar vendors. Reading Russian means you can manage maps and menus. For me, it also means I can have a better handle on the contracts I conclude and discussions I have with my agency partners in Uzbekistan and Kyrgyzstan. So this June I undertook a 4-week intensive Russian program at The London School, Bishkek (TLSB). Why Bishkek? Because the program has an excellent reputation and is far less expensive than studying in Russia. 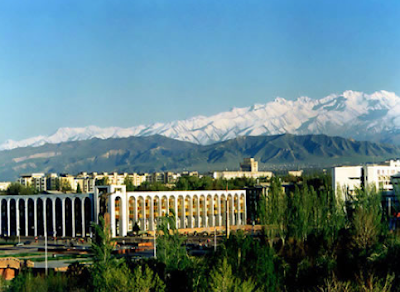 And Bishkek is a pleasant, provincial city, particularly in summer. Three enterprising women established TLSB in 1998. It provides one-on-one Russian and Kyrgyz programs for foreign students and local expatriates as well as English programs for Bishkek locals, particularly young people. All Russian classes are conducted in individual classrooms by competent, English-speaking staff and the fee is US$6 per hour. Students have the opportunity to stay at the on-site dormitory or to live with a Russian-speaking Kyrgyz family. I opted for the US$8 per night dormitory. My basic room had a bed, a wardrobe, a chair, a table and two power points. The rate included weekly cleaning. I shared a simple kitchen and bathroom with one other student and there was also a washing machine. TLSB has a library (though books can only be used in the library itself) and a small cafeteria. I was enrolled in the morning program: four days a week, from 8:30 a.m. – 2:20 p.m., with three 10-minute breaks and a half-hour lunch. There was no textbook. The program was electronically based, including homework, which regularly took me about five hours a night. The school offers free, revision classes on Wednesday afternoons, which I had planned to do. However, once I arrived I understood why Wednesday is a free day - apart from time for chores, my brain was exploding! TLSB also arranges day and weekend trips: hiking near Bishkek, visits to Issyk Kul lake etc., for which a modest fee is charged. I did not participate in these, as I know those areas very well and preferred to focus on my studies. 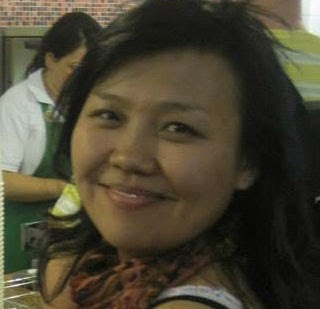 Jyldyz Abdygazieva was the administrative point person for the Russian program. Jyldyz is a dynamo, patiently managing a whole range of issues for a disparate and demanding group of learners. The school’s location is convenient. It is a 30-minute walk to the city centre or a 10-minute 10-soum ride in a marshrutka (local collective mini-bus). A large shopping centre, VEFA, is just two minutes by foot. As well as a ground-floor supermarket there are cinemas and fast food restaurants on VEFA's top floor. My favourite café, however, was Cave Coffee, around the corner from TLSB at 19 Gorky Street. The decor was cool, the reasonably priced menu included many fresh options and the wifi was fast and reliable. It is open 24/7. I was very impressed with my program and the quality of the staff. Below are some suggestions of easy steps that TLSB can undertake to make its programs even better. TLSB advises me that they already working on some of the proposals, such as a grammar guide for the beginners' program and a welcome kit. 1. Ensure a fast, reliable wifi service. This was the most-voiced complaint by students. The wifi regularly crashed and on weekends there was little technical support. Given that all homework is based on accessing the course e-books via wifi, it is crucial that students have reliable internet access. It would be very convenient for students (and time-saving for TLSB's staff) to provide an FAQ about staying and studying at TLSB. For example, sheets (though somewhat smaller than the beds) are provided, but not a towel. Suggest students bring a power board to make up for the lack of power points in the room. (My room had two power points, though most had only one). Advise that from mid-May through mid-June there is no hot water in Bishkek. (To undertake essential maintenance on Bishkek's central heating system, hot water is unavailable every year from 11 May - 11 June). Although staying with a local Russian-speaking family seems a sensible option to practise the language, most families with whom students stayed did not have internet access. Some families lived 30 kms from TLSB so commuting times are long. Families take their responsibility of looking after a student very seriously - you are expected to advise them where you are, when you will be back etc. A map of the city (freely available in Bishkek's hotels) could be included in a welcome kit for students, along with advice about buying a local mobile phone/sim card (cheap and worthwhile), changing money at exchange offices and general tips about staying in Bishkek. 3. Suggest materials to bring. It would be helpful to advise students to bring a dictionary and any grammar books they already have. 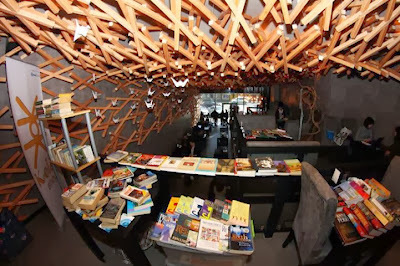 Dictionaries in Bishkek’s only bookstore were scarce and expensive. TLSB's library does not permit borrowing and the programs are entirely online. 4. Match the teacher's English-language skills with the level of the learner. For a complete beginner Russian is extremely complex and progress can be expedited if the teacher can explain grammatical rules in clear English. 5. Fix the errors in the e-books. These books form the basis of the lessons and homework. There were many confounding mistakes that could have been immediately remedied by the network administrator. It would also be helpful if stress marks are included on words. Although in written Russian they are not inserted, it could increase reading confidence in the early stages. There were many problems opening and locking dormitory doors and the main gate to the school. This is a basic safety issue that should be addressed seriously by the school. So – how is my Russian? Not nearly as good as I had hoped, despite the dedication of my excellent teachers! It is such a beautiful, rich language. And such a difficult one. I thought I had mastered the Cyrillic alphabet and on one level I had. But I struggle with pronouncing three or four consonants together. And knowing where to place the stress on a word is still a mystery, as a stress mark is not used in text. Some handwritten letters bear no resemblance whatsoever to their printed form. I pride myself on my foreign language skills, so it has been a humbling experience. Overall, my time at TLSB was positive and I have enrolled for another month in June 2014. This time I should be better equipped to manage my time and learning at TLSB and look forward to big strides in my Russian. If you are interested in learning Russian there visit The London School Bishkek's website.